Starting from November 17 in 2018 until now, the Yellow Vest movement has lasted for about 2 months and spread wildly in Europe, even reaching Canada. It was originally against President Macron’s policies on increasing fuel tax, and the topics of protesting have expanded to all types of appeals including asking Macron to resign. However, the protesting movements usually turn into violence. The famous Arc de Triomphe was damaged and some collections in its museum were stolen or destroyed. Unlike many other protest movements, the participants were not organized leaderlessly. The messages spread across social media and was relatively out of the control of the government. And the yellow vests they used become the symbol of this movement. When the protest started, President Macron was in Argentina for the G20 Summit. By the time he departed, on November 17, there were over 300 thousand protesters across entire France. Due to the pressure from the public, he announced to increase the monthly minimum salary by €100 and working overtime would not be charged taxes. And the most important, he declared not to levy the fuel tax. However, looking at the present situation, it seems that lots of French people didn’t buy it. The reason why the protest continues is not just about the fuel tax. The tax is only a trigger and the protest has already changed its focus to the maladies that spread their roots deep and wide in the soil of the country. This movement shows the huge challenge of reforming in France. After times and times of failure, the government and the parliament have lost the trust of the people. Some protesters say that “The representatives that we elected support the act that is against our interest and will”. And for some serious problems that would result in against when deciding by referendum, they would be decided inside the parliament rather than the people. That is why the fuel tax becomes the trigger. Meanwhile, the parliament loses its power to counterbalance the president and correcting the mistakes he made. Even though the parliament is controlled by LaREM, the party that Macron belongs to, the way that Macron carries out his reform plan is using executive orders rather than letting the parliament vote to make it pass. He is doing this too rough that he does not play by the rule. And even his decisions get to be decided by the parliament, it can only pass it because of Macron’s advantage of capturing more seats. Even his policies changed completely after returning from the G20 Summit, the parliament still make his policy passed. The mistakes he made cannot be fixed by the parliament because of that. Another reason can be concluded as Macron’s lack of experience. He is actually an amateur in politics and he does not know enough about the life of the grass-roots. He studied in elite institutes and worked for Rothschild & Cie as an investment banker. He has only been in the field of politics for 6 years. All this can be clearly seen by his actions. When returned from Argentina, he went to see the protesters at the square. He told one of them, “I can find you a job just by crossing the road”. He stays too far away from the people and knows nothing about dealing with their feelings. And that is why his popularity fell to 25% in November. If looking at the French society, the transformation is necessary and needs to be done as soon as possible. However, thousands of Yellow Vest protesters proved that the greatest challenge for the transformation is the loss of belief to the government and the president. It also enlarged the divergence between upper and lower classes, leading to the rise of populism. And no one knows when and how the chaos will end. 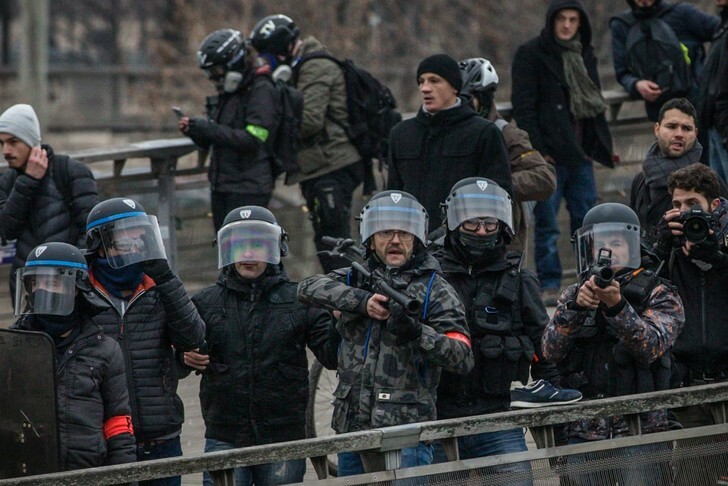 “Many Protesters Have Expressed Disappointment at the French Government’s Measures to Defuse Tensions and Are Planning More Protests across the Country on Saturday.” Silk Road Gazette, Silk Road Gazette, 14 Dec. 2018, www.silkroadgazette.com/support-for-yellow-vest-protests-in-france-continues-in-rural-towns/. Morissard, Aurelien. “Chistophe Dettinger, Avec Le Bonnet Noir, Le 5 Janvier à Paris.” La Croix, La Croix, 8 Jan. 2018, www.la-croix.com/France/Politique/Gilets-jaunes-cagnotte-soutien-Christophe-Dettinger-recolte-115-000-euros-2019-01-08-1200993809. Quentin, Jean-Baptiste. “Emmanuel Macron Tiendra Une Cérémonie De Vœux Aux Armées Le 17 Janvier.” Le Parisien, Le Parisien, 8 Jan. 2019, www.leparisien.fr/politique/emmanuel-macron-supprime-ses-traditionnels-rendez-vous-des-voeux-08-01-2019-7983624.php. Bell, Stewart. “Facebook Reviewing Comments about Killing Trudeau on Canadian ‘Yellow Vests’ Page.” Global News, Global News, 9 Jan. 2019, globalnews.ca/news/4827607/facebook-comments-killing-trudeau-canadian-yellow-vests/. “France Backs down, Delays Tax Increases after Paris Rioting.” NBCNews.com, NBCUniversal News Group, www.nbcnews.com/news/world/france-backs-down-delays-tax-increases-after-paris-riots-n943381. “France Protests: What Is Happening? – CBBC Newsround.” BBC, BBC, www.bbc.co.uk/newsround/46427610. “Macron Tells Young Jobseeker: ‘I Can Find You a Job by Crossing the Road’.” BBC News, BBC, 16 Sept. 2018, www.bbc.com/news/world-europe-45541697. “Macron’s Popularity Falls to 25% – Poll.” News24, 18 Nov. 2018, www.news24.com/World/News/macrons-popularity-falls-to-25-poll-20181118. “When English Media Report on Emmanuel Macron.” Fair Observer, Fair Observer, 12 Dec. 2018, www.fairobserver.com/region/europe/french-protests-gilet-jaunes-emmanuel-macron-speech-world-news-headlines-today-13901/. “Yellow Vests: France to Crack down on Unsanctioned Protests.” BBC News, BBC, 8 Jan. 2019, www.bbc.com/news/world-europe-46788751.